What does animal welfare mean? 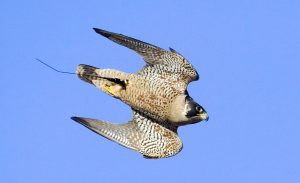 2. a bird that has no reservations towards humans about sharing both the hunting event and the prey with the falconer. These premises provide a unique and mutually beneficial partnership between the raptor and the falconer. It must be recognised that the only way to achieve excellent performance from a falconry bird is to have it in peak fitness, optimal health and subject to a minimum of stress. 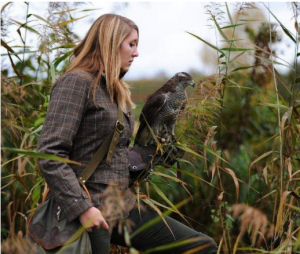 For over 3000 years a considerable body of knowledge has been developing on the management of falconry raptors to optimise hunting performance, minimise stress and prevent disease. To understand the behaviour of the bird, and the training provided by the falconer, one has to take into consideration the reasons for animal behaviour. Every behaviour has, at least, the aim of preserving the life of the animal so that it can transmit its genes to the next generation. Birds of prey in the wild have a survival rate of approximately 20% of hatched chicks. This means that about 80% die in their first year; most of them starve in autumn/winter. For this reason, raptors are ‘energy efficient’ predators that are largely sedentary when not hunting. Besides positive motivation, negative feelings can influence the behaviour of many animals. In social animals like horses and dogs, negative reinforcement – especially if caused by an individual of higher social rank, e.g. a human trainer – can lead to the desired learning experience. Falconry birds are not social in this sense: negative reinforcements caused by the falconer would just make them avoid the falconer. For this reason falconry practice is based on training through positive reinforcement alone, and the avoidance of stress. In addition to this understanding of behaviour, physical inviolacy (safety from injury or violation) is crucial. And, of course, veterinary care is obligatory. This includes a laboratory check of the mutes (faeces) twice a year, and immediate medical treatment by a specialised avian veterinarian if necessary. The maintenance of intact primary feathers also has to be a priority; damaged primaries prevent a raptor from being a successful hunter. The term ‘animal welfare’ can be seen from legal, aesthetic, ethical and biological points of view. In discussions of falconry the biological aspect is especially relevant, because there are no biological differences between hawking birds and their wild counterparts of the same species, irrespective of the cultural or legal background of the falconer. Two animal welfare concepts must be specifically addressed: ‘Meet Demands and Avoid Damage’, and the concept of the ‘Five Freedoms’. This concept was developed by a group of Swiss and German ethologists (the ethological working group of the German Veterinarian Society – Tschanz et al, 1987). At present it is the most often used method in deciding whether a certain phenomenon has animal welfare relevance or not. The concept of Meet Demands and Avoid Damage arises from the assumption that every organism is capable of self-creation and self-maintenance. Whether an animal can manage self-creation and self-maintenance sufficiently can only be evaluated if the animal is able to fulfil its demands and to preserve itself from damage. To achieve this, the animal uses physiological and behavioural ‘tools’ acquired through both evolution and individual development. In this way, animals use or avoid structures and conditions in their environment. When we keep animals in captivity, these structures and conditions are our responsibility. If the adaptability of an animal is overstretched, physiological and/or ethological damage will occur. Physical damage can often be easily identified, even without knowledge of the species, and there is no dispute that injury harms the welfare of the animal. Ethological damage will be recognised through disturbed behaviours. This is often not so easy to detect, and there is much discussion as to whether disturbed behaviour does really indicate poor welfare. The concept of Meet Demands and Avoid Damage claims that if there are significant numbers of injured or damaged individuals associated with a certain keeping or management system, that system is not compatible with the approach of animal welfare. For this judgement, the seriousness of the damage is taken into consideration as well. The concept of the Five Freedoms was founded by the Farm Animal Welfare Council in 1979. It focusses on farm animals, which are all social animals – a behavioural pattern that birds of prey do not generally share. Birds of prey live facultative, mostly solitary lives. Because of this, the company of the animal’s own kind is not crucial, as it would be in herd or flocking animals. 3. Freedom from pain, injury and disease, through prevention and rapid diagnosis and treatment. 5. Freedom from fear and distress, through the ensuring of conditions and treatment which avoid mental suffering. With the exception of companionship, as explained above, the falconry bird is covered by all of these stipulations. For proper handling, a falconry bird has to be fitted with jesses on each of its legs. Like dogs with collars and leads, or horses with bits and reins, the birds can be handled with jesses during training and in the field, and be tethered in the breaks between hunting. Left: hood. Top: Nylon braided jesses and leash. Bottom: Leather anklets and jesses. 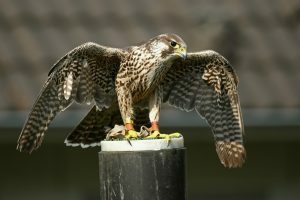 There are different types of jesses in use, depending on the species of bird and the cultural heritage of the falconer. 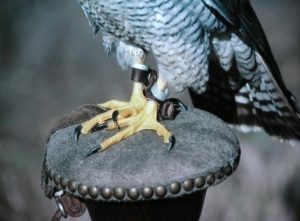 Most often, in Western falconry, leather Aylmeri anklets are fitted. Removable jesses, made of either braided nylon cord or leather, are passed through the anklets and connect together at a swivel. 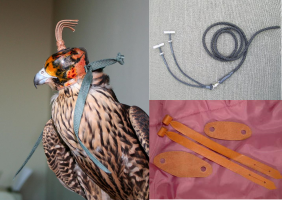 A leash is attached to the swivel and this is tied to the glove of the falconer or to the perch. Diurnal birds of prey are almost solely visually orientated. To avoid stress in unfamiliar environments or to prevent them from bating (jumping from the perch or glove) at unhuntable prey, hoods are of immense value. 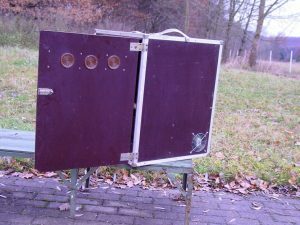 Raptor travel box, showing ventilation grilles. While travelling, any negative effect caused by a different climate has to be avoided, as does stress through unfamiliar stimuli. Hoods can be used to protect the bird from stress; travel boxes are also suitable. If temperatures are high then travel boxes can be ventilated with a small electric fan, powered by a battery or the car cigarette lighter. Any housing that is intended to last more than a very short time, unless it is for use only in fine weather, must provide shelter from rain, intense sun and especially from draughts. Every day, if it is not freezing, a water bath has to be available for several hours. Attention has to be paid that the bird does not come into contact with its mutes. Security against free-ranging predators has to be provided; domestic cats and even rats can actually kill smaller birds of prey, especially in an urban environment. For housing, two different methods are in use. 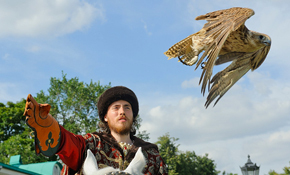 Essential for initial training is the use of the traditional falconry method with jesses (as mentioned above) and perches. There are different types of perch, such as screen perches, blocks, bow perches, and flight-line arrangements. 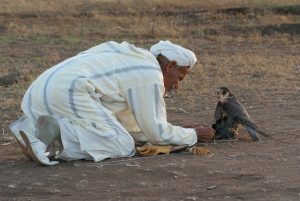 The falconer will choose the perch depending on the species, the stage of training and the location. A flight-line arrangement is difficult to transport to hunting grounds or a falconers’ meet but at home it is a very useful tool, especially for accipiters like goshawks, giving them almost the same freedom as an aviary, but with much less danger of damage, e.g. feather damage on wire mesh. Tethering is exclusively recommended for birds that are regularly flying free, as when hunted or during training – or for the rehabilitation of wild birds found sick or injured. If birds are not flown during the moulting period, they are best kept in aviaries, or tethered with flight-line arrangements. Aviaries are a perfect housing system for most of the species in the moulting period, and are crucial for breeding pairs. The absolute size of the aviary is not the crux of the matter, but attention has to be paid so that no damage can occur due to the construction of the pen, especially to the primary feathers. Some very tame and calm individual birds, especially buzzards, eagles and Harris’ hawks, can be kept in aviaries made completely from mesh wire but most raptors must be shielded from the wire to avoid damage to the beak, cere (the waxy skin behind the beak) and primary feathers. Very fine but strong nylon nets, such as those used by farmers to protect their silage from crows (‘silage netting’), or ‘shade cloth’, may be used for this purpose. Most birds will do better if up to three walls of the aviary are built with non-transparent material. For most breeding pairs, and for some particularly anxious individuals, such as goshawks, sunlight and seclusion pens work best. Ventilation is important in open-roofed pens, and ample ventilation needs to be installed above floor level in the form of a ventilation point or slot. This will create a chimney effect, drawing in cool clean air at the bottom and expelling warm air at the top, and will also aid in drying the floor surface after rain. 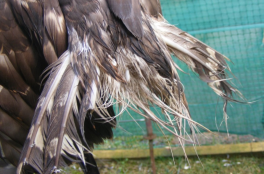 To avoid stressing the hawk by entering the chamber, it is recommended to use a flap system to accommodate the removal of the bath when changing the water. A food chute is advisable for the same reasons. Every solid wall should have a smooth surface. Mesh wire, if used, should be covered, as described above; in many cases, wooden vertical bars would be better as a wall than mesh. The roof should be partly closed to give protection from bad weather, and partly open to give access to sun and rain. Any mesh wire on the roof should be double laid and/or small meshed to protect the inhabitant from wild raptors and other predators. Every aviary must have a double door system to avoid the unintended exit of the hawk. 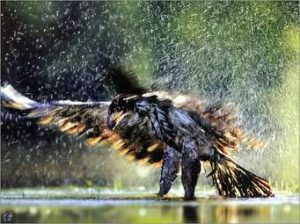 The aim of training is to shape the bird into perfect physical condition and to teach it to catch prey successfully. Raptors are supreme athletes and, as with human athletes, their bodyfat has to be reduced, but not depleted totally; their muscles have to be built up. 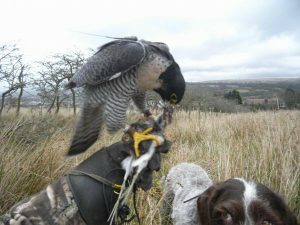 The bodyweight, though, is not the main indicator for hunting motivation; experienced falconers will also closely monitor the behaviour of the bird. It is very useful to monitor the weight daily with proper scales and to document it in written form. Weight will give a good indication of the bird’s appetite and general health. Different exercises have been invented to improve fitness. Depending on the species of the hawk, these can be important if it is not possible to fly it on wild game at least every second day. The principle is that the food is given as reward just after the bird has put in some effort for flying. For longwings like falcons, lure, kite or balloon training works well. Shortwings like goshawks or Harris’ hawks do best flying from fist to fist between two falconers, or with vertical jumping. The use of bagged game (if allowed by local laws, and depending on national or regional norms and standards) may be acceptable, but is not promoted by the lAF. Live animals used in this way must be handled carefully and killed quickly after they have been caught, as with wild prey. During hunting, the safety of the bird, and the prevention of unnecessary suffering for the prey, have the highest priority. The falconer must pay attention to all the dangers that may occur on the hunting ground, for example traffic, inquisitive but uninformed people, wild, feral or pet predators, and many other manmade and environmental risks. The size of the hawk and the size of the quarry also have to match one another. Captured quarry, if not already killed by the bird, must be killed by the falconer as soon as possible in the most humane way. lmping, a falconry technique for repairing broken feathers, can only be learned through practical demonstration, for example by a mentor. To ensure that falconers have the knowledge to fulfil all the requirements mentioned in these guidelines, the lAF recommends that anyone who would like to become a falconer should undertake an apprenticeship with an experienced falconer for at least one hunting season. The IAF also recommends that aspiring falconers join a falconers’ club to make contact with other falconers. 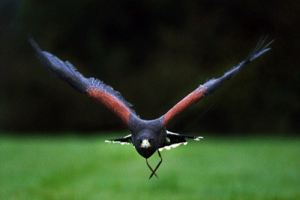 You can find links to falconry clubs around the world on the IAF website. 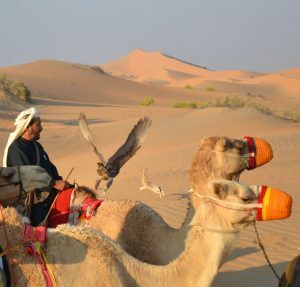 In addition, a good falconry course should be taken, even if it is not required by law in your country. 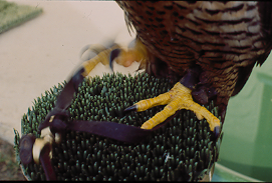 You can find further material on raptor husbandry in Links and Resources. 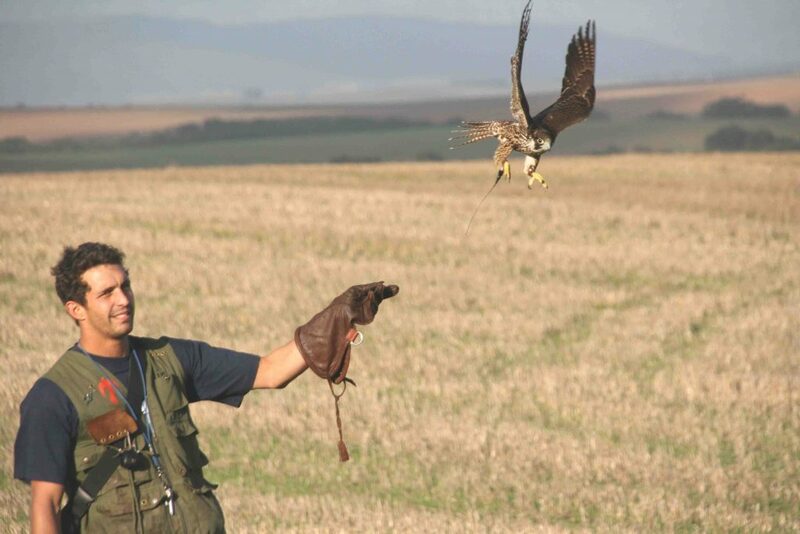 To governments and administrations, we suggest that the provision of a falconry licence, based on the completion of an apprenticeship and a falconer’s exam, may be included within your hunting legislation.